Place sausage pieces in 12-inch nonstick skillet or Dutch oven. 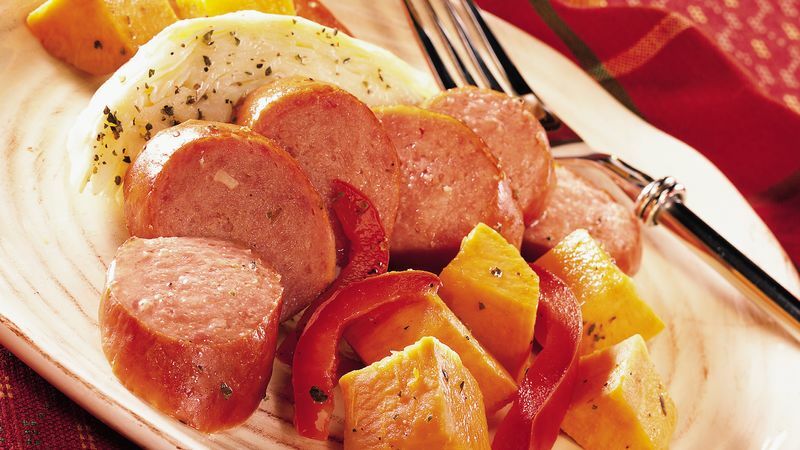 Arrange sweet potatoes, cabbage and bell pepper around sausage. Sprinkle vegetables with marjoram, salt and pepper. Add broth to skillet. Bring to a boil. Reduce heat to medium-low; cover and cook 15 to 20 minutes or until vegetables are tender, stirring occasionally. The word "cabbage" comes from caboche, a French slang word for "head." Choose a cabbage that's heavy for its size with crisp, firmly packed leaves. Cabbage is a cruciferous vegetable; it contains antioxidants which may reduce the risk of some cancers. Sweet potatoes are one of the best sources of vitamin A.
Dutch ovens are used for steaming and braising. These pots are of Pennsylvania Dutch heritage from the 1700s.